It might be a little like giving birth, I suppose, though I’ve never given birth. The saying goes that women forget all the labor pains and pregnancy woes and will go through it again. And again. And yet again. Because children bring so much joy into their world that it overshadows any memory of the pain of pregnancy. That’s apparently what happened to me. Returning to Ecuador, not pregnancy. I’m happy to report that this time was different–it was better. This time I was prepared with a small bag of coca tea I purchased at the market in Cuenca the day before. He claimed that he bought it in Peru, as it’s illegal to grow it in Ecuador, and I trusted him. I bought $5 worth of the dry olive-colored leaves that looked a little like bay leaves in your pantry, and as he handed me the thin plastic bag full of might-be-or-might-not-be-illegal leaves, I asked him if he could put a little more in it. “I want to make tea,” I said and he obliged and added a pinch more of leaves, twisted the top of the plastic then tied it into a loose knot. Coca leaves. Yes, the same plant from which cocaine is derived. But I had no interest in drugs. 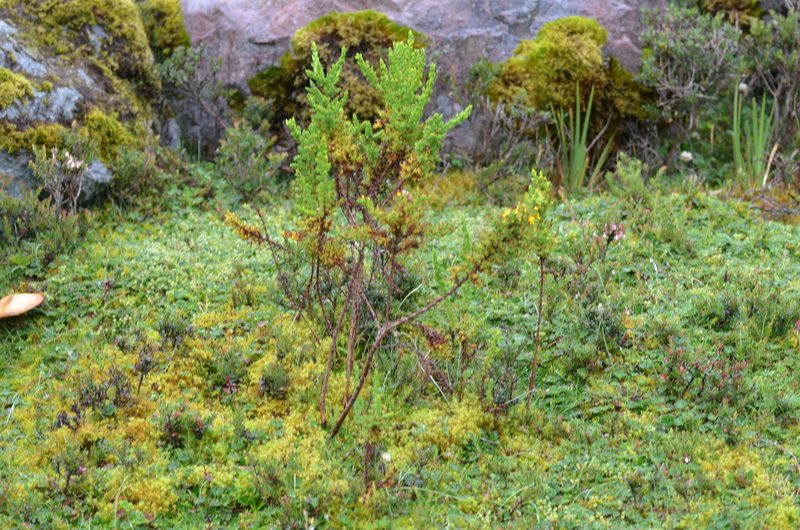 I was in Ecuador again to see birds because birds bring me joy, and this time I wasn’t going to let altitude stop me. 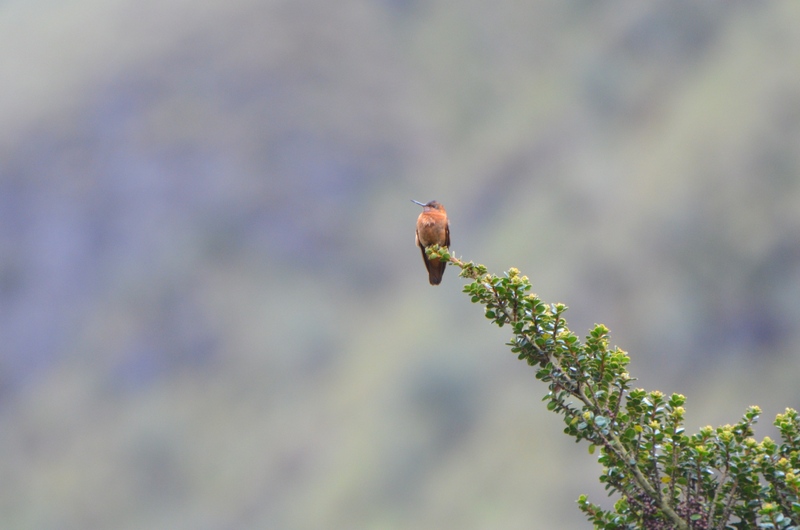 Our first day of birding began at El Cajas National Park, about 20 miles west of Cuenca, straddling the continental divide in the highlands of Ecuador. The highest point is 14,600 feet (4,450 m), hence the coca leaves. We worked out a custom tour with Tropical Birding and they arranged for José Illanes to be our guide–our same guide we had last year when we took Tropical Birding’s Andes Introtour. As soon as our van started to climb the steep, winding road up toward El Cajas I grabbed a wad of the dry leaves from the plastic bag and started chewing them. I got no more of a rush from chewing the leaves then I do from drinking a Diet Coke, but I was confident this is all I needed. Before we reached the park visitor’s center we birded from the road and saw a few Turquoise Jays who were not particularly cooperative, hiding in the trees behind intertwining leafy branches. I suppose if we wanted to hang out there on the side of the 2-lane highway as semi trucks whooshed by, we could have for hours and maybe got a good photo of the jays, but alas, we had more birding to do. I was feeling better this time at this high altitude and I kept the leaves under my tongue as instructed. We later found a place to pull off the road and walked along a gravel road until the road turned into a path. Here the birding was easy and the hummingbirds cooperative. We didn’t see the Large Hummingbird—the largest of all hummingbirds, which this area is known for—but we did see the endemic, Violet Throated Metaltail and the Shining Sunbeam. At the highest elevation we stopped so we could hike to the lagoon, but it was cold, windy and rain was spraying sideways. My fingers had turned purple from being outside, so I hung out in the van with our driver, Jorge, as Steve and José hiked down to the lagoon. It was still a little chilly in the van but not as brutal as being outside. After an hour the brave Steve and José returned and José gave Jorge instructions to head on down toward Guayaquil. Jorge started the engine and soon the heat from the vents poured over me and I felt warm again. “Now get ready to start peeling off your cloths,” José said. “In a couple hours you’re going to be so hot you’ll wish you were back up here. I had no idea how right he would be. I just kept chewing my coca leaves and thinking, High Elevation? Nailed it! I could do this again. And again.